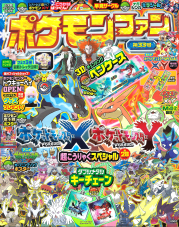 The magazine began running the XY Chapter in its thirty-third issue. Our heroes are walking along one day when they are attacked by a wild Onbat. X and his Garura jump out from under their blanket, make quick work of their attacker, and then return to their cart. Soon after the five of them are approached by a man whose job it is to invite Trainers to a newly completed "Super Training" facility. Once inside the stadium-like dome our heroes listen to an explanation of the various types of Super Training their pokemon can undergo. Meanwhile, Y glides through the sky up above on patrol. She soon discovers that two members of the Flare-Dan have been following them and that the Onbat from before was one of theirs! The red-suited grunts have their Onbat use supersonic waves to mask everyone's sense of hearing, preventing them from issuing any commands to their pokemon. X, meanwhile, sees a large Whaleko balloon and motions for his Harimaron to pop it with the spikes on its head. Soon after the large balloon robot is sent flying through the air, sending the Flare-Dan agents blasting off in the process. Now that their pursuers have been taken care of our heroes resume their journey to Miare City. Y's Yayakoma's nickname is revealed to be "Yako-chan" (ヤコちゃん). Sana's Eneko is nicknamed "Neko-P" (ネコＰ). There's a Japanese saying, Kabe ni mimi ari shouji ni me ari (かべに耳あり障子に目あり), which is equivalent to "the walls have ears." There's also a bit in there about "and the sliding doors have eyes," but we English speakers don't really say that part. 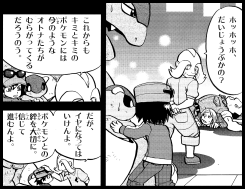 In this chapter of Pocket Monsters Special, Y misquotes this well-known saying as Kabe ni mimi ari shouji ni fearii (かべに耳あり障子にフェアリー), sticking the word "Fairy" (as in "Fairy-Type") in place of me ari, producing something like "The walls have ears and the sliding doors have Fairy." X's first line of dialogue in this chapter is to correct her. Y is doing her best to become close friends with the Eevee she caught the day before but the pokemon keeps running away! She asks Keromatsu to use its Kero Mousse to help stop this but Eevee puts an end to the attack simply by staring at its opponent! Later, Eevee runs off again and finds its way to a carnival where a number of mini games are being played. 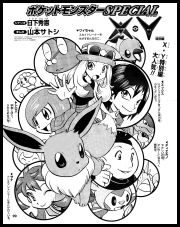 Y decides to play Head It, Tile Puzzle, and Berry Picker with her Eevee to help the two of them bond even more. During all this, X calls Trova over and tells him that the staring move Eevee used earlier was most likely Baby-Doll Eyes, one of the newly discovered Fairy-Type techniques. Suddenly, a Numail belonging to two Flare-Dan grunts jumps out from the tree where the Berry Picker game is being played and attacks Y! Eevee jumps forward to save its Trainer, evolves into Nymphia along the way, and uses its ribbons to send the Flare-Dan grunts flying. It then finishes off its Dragon-Type opponent with a kiss move. With their attackers taken care of, Y and the rest of our heroes resume their journey with their new friend. Y's Eevee / Nymphia is nicknamed Bui-Bui (ぶいぶい). It is revealed to be a female. The kiss move that Nymphia uses at the end of the chapter is never named but is most likely meant to be Drain Kiss. In the Master Tower in Shala City, Corni approaches Concombre, her grandfather, and demands to know why he gave a young boy named X a Mega Ring without making him go through a "successor ceremony" first. He responds by telling her about how he helped save the young Trainer from a duo of reporters who were harassing him after he had just won the Junior Tournament. 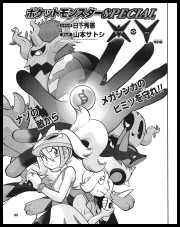 Once the two are driven away, he continues, he hands over the Mega Ring as a reminder of the bond X shares with his pokemon. Corni argues that the story doesn't explain anything. Suddenly, Concombre is attacked by an unknown assailant! Corni and her Mega Lucario run up the tower to find their attacker and eventually come across an Ohrot! But where is its Trainer? Corni leaves the battle up to Mega Lucario while she returns downstairs to look. There, she sees a woman named Esprit appear before Concombre and demand he tell her everything he knows about Mega Evolution. When Esprit finds out that the only people who know about this phenomenon are his family and the people he's entrusted a Mega Ring to, she charges forward with her Bokurei, ready to attack! 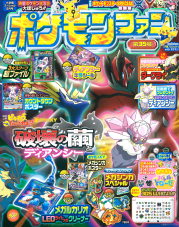 Most of Concombre's flashback is a reprint of the version X told in the chapter printed in the April 2014 issue of CoroCoro Ichiban! The big difference here is that Corni's grandfather is no longer covered in shadow. Esprit (エスプリ) is not actually identified by name in this chapter. As the battle between Mega Lucario and Ohrot continues, Corni realizes that her opponent is at a much higher level than she thought. She then realizes that one of Ohrot's roots is running down the side of the tower and into the ground below. Could this be the source of Ohrot's power!? Below, Corni's grandfather tells Esprit that, as a member of the Flare-Dan, she isn't elligible to learn the secrets of Mega Evolution. 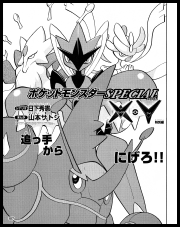 He then uses his Heracross, who can evolve into Mega Heracross, to take out Esprit's Bokurei. Corni is called to the scene to help him chase Esprit away but a thick wall of tree roots springs up between Esprit and her pursuers, preventing them from going any further! Esprit explains that the roots have surrounded the Master Tower and are making it impossible for them to escape, leaving Corni and Concombre with no choice but to activate the tower's self-destruct system and leave it behind. As Esprit makes her retreat, she informs her opponents that she's not affiliated with the Flare-Dan. Once the Master Tower's reduced to rubble and Esprit is out of sight, Concombre looks back, hopeful that the existence of "that pokemon" went unnoticed. 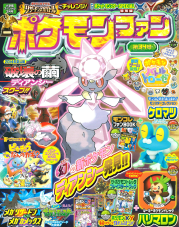 The silhouette of "that pokemon" makes it obvious that Concombre is talking about Diancie. Corni dozes off and dreams about the time she went out with her Riolu to search for the Mega Stone needed to evolve into Mega Lucario. She eventually finds it and, after evolving her pokemon into a Lucario, is able to take part in the successor ceremony. Once finished she joins with Concombre's other disciples to Mega Evolve her pokemon. Corni is awakened from her dream by the Champion Carnet who tells her that her grandfather is in trouble. When she looks down she sees Concombre and Mega Heracross surrounded by a large group of Kuzumo! Corni and Mega Lucario step forward and help clear away the pokemon until there's only one opponent left; Flare-Dan Executive Akamaro and his Doramidoro! Carnet uses her Mega Sirnight to drive the Flare-Dan member away. 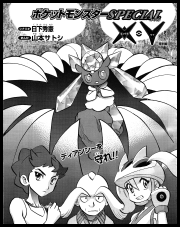 Later, the Champion tells the others that the two legendary pokemon who attacked Asame Town are now in hiding and that the Flare-Dan already know where Xerneas is. So, she reasons, they should find Yveltal before the Flare-Dan gets to it first. Meanwhile, the Four Heavenly Emperors' Pakira uses a Holocaster broadcast to tell everyone that she's going to find out the reason for Carnet's abrupt break from acting. 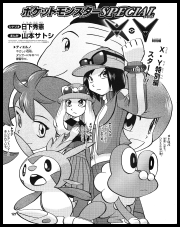 Akamaro is known as "Butler Chalmers" in the English versions of the XY games. He battles the player during the fourth chapter of the Handsome postgame story. Tierno shows off his dance moves at a skate park while X sits in his tent studying his Pokemon Zukan. 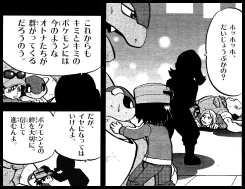 Tierno wants to practice by himself and so he and his Heigani climb a nearby hill. The two of them are going down a particularly steep rail when Tierno is suddenly hit in the face with a notebook! The notebook, "The Occupy the Monster Ball Factory Plan," details an operation by the Flare-Dan to take over the factory and stop the flow of Monster Balls to the public! The notebook's owner, a Flare-Dan grunt with a Flygon, explains that her organization's goal is to restore beauty to the world by "stealing" power from some and then "giving" it to people like them who deserve it. X arrives on the scene to help but Flygon uses Earth Power to disorient its opponents while remaining out of reach above. X recalls reading about how strong Heigani's pincers are and so he has his pokemon distract the Flare-Dan while Tierno's pokemon clamps down on Flygon's wings. The Dragon-Type pokemon falls to the ground, knocking both it and its Trainer out cold. Later, our heroes head back to the others to resume their journey. The wealthy master of the Shabboneau Castle has ordered his servants to seek out the "Jewel Pokemon" Diancie so he can admire its beauty. Nearby, Carnet, Corni, and Concombre have set up camp. Carnet tells Corni all about the Four Heavenly Emperors and explains that Pakira is the only one she never really got close to. Just then they see a group of agitated looking Meleecie hurrying into a nearby cave. Carnet and the others follow and soon discover that their Princess Diancie has been kidnapped by a jewel thief! 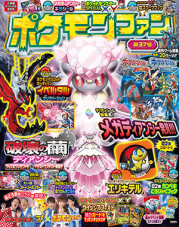 He sends out his three Kametete to overwhelm them but Carnet comes up with a plan to lure the thief out of the cave so Diancie can absorb the moonlight and use its powerful Moon Force attack. The plan works and, after Diancie follows up with a Diamond Storm attack, the thief is sent running. Later, the thief returns to his client, Pakira of the Four Heavenly Emperors, and hands over the few diamonds he actually was able to get his hands on. Back near Shabboneau Castle, the master calls off the search for Diancie and decides that it's better to let both it and the Meleecie live in peace. 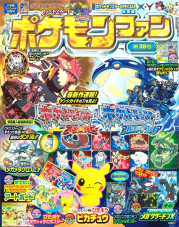 This is the final chapter to be printed in Pokemon Fan magazine for the immediate future. 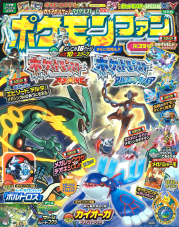 Mr. Kusaka has stated on the official Pocket Monsters Special website that part of the reason for this has to do with the serialization of the Omega Ruby Alpha Sapphire Chapter on Club Sunday. 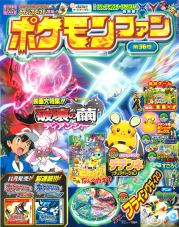 He assures viewers that he will still act as an editor for Pokemon Fan magazine during this time and that his duties there will not end.